For your area rugs, each rug's particular weave, fibers and dyes are individually inspected and deep cleaned to bring it back to like new condition. Once the cleaning process is completed a stain resistant coating is then applied to keep them in this condition as long as possible. American Carpet Cleaning cleans the fine Oriental antique area rug at the best area rug cleaning prices for our Northridge, CA customers. Thousand Oaks, CA residents are going to want American Carpet Cleaning for their Persian area rug cleaning needs, too, because it’s not advisable to clean these precious fine area rugs yourself in your Newbury Park, CA home. 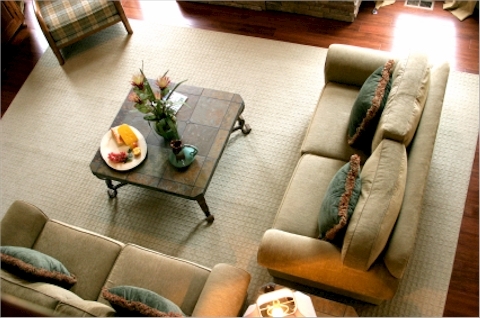 You need a professional area rug cleaner who knows hand washing or delicate steam cleaning is the way to go. If you try to clean your Afghan area rug on your own in your Camarillo, CA house, you risk permanent damage. Then your fine wool area rug will be nothing but shag! The value of your Indian area rug in your Moorpark, CA home will be zero – an investment gone down the drain with the stain! Fortunately, your Karastan area rug that hangs in your Westlake Village, CA hallway or you Oak Park, CA office need not suffer the DIY curse. American Carpet Cleaning will come to your Ventura, CA residence or you Oxnard, CA suite and get out any allergens, dust mites, sand, pet urine odor, dirt or hair that might be trapped in your natural Navajo area rug. It doesn’t matter what type of fiber, material, dye or weave your area rug is, American Carpet Cleaning will make sure that when we’re finished, you will have a clean area rug that deserves its place of honor in your Northridge home. Once your fine silk area rug is clean, American Carpet Cleaning also can do the necessary area rug repairs at the best area rug repair prices. That includes mothproofing or fixing the binding or fringes. And if any of our Thousand Oaks-area customers want that clean area rug appraised, American Carpet Cleaning might be able to provide a free appraisal. American Carpet Cleaning is your contemporary rug cleaner of choice. Normally for a small additional charge we can even repair, provide re-fringing and padding replacement.